Ahh, Valentine's Day. The international day of arrow flinging flying babies, overpriced heart shaped boxes of cheap chocolate and inexplicable teddy bears for grown adults. But it's also a day where maybe those who aren't always ready to express their squishy feelings might finally get their romantic on, so it can't be all bad, right? 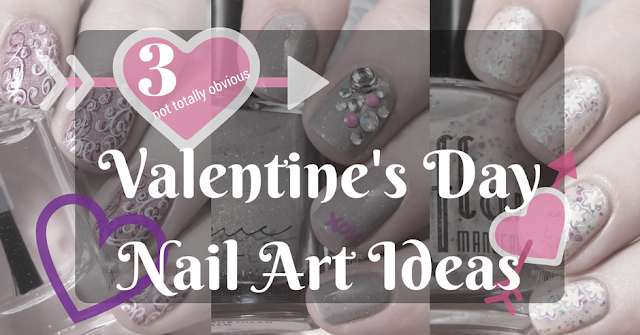 Plus it also means I let my inner ultra femme get creative with some Valentine's Day inspired nail art! So I'll officially end the grump fest here and revel in some sweet, but still not totally obvious and overdone Valentine's Day designs. This cute daisy chain look is easiest done with a stamping plate - I used BPL-008 - but daisies are easy to freehand too! To get this look start with the base of your choice and finish with a quick dry top coat. Once your polish is dry, stamp your daisies down the centre of your nail. Using a detail brush (or a toothpick, or a bobby pin) place a dot of yellow polish in the centre of the daisies. Give this a couple minutes to dry and finish with another layer quick dry top coat. Super easy! You'll definitely need either mad skillz or a clear jelly stamper for this double stamped swirly tendril look. I chose to go with clear jelly stamper. Start with the base of your choice and finish with quick dry top coat. Once your polish is totally dry, protect the skin around your nails with liquid latex (or don't - but be prepared for extra cleanup!). 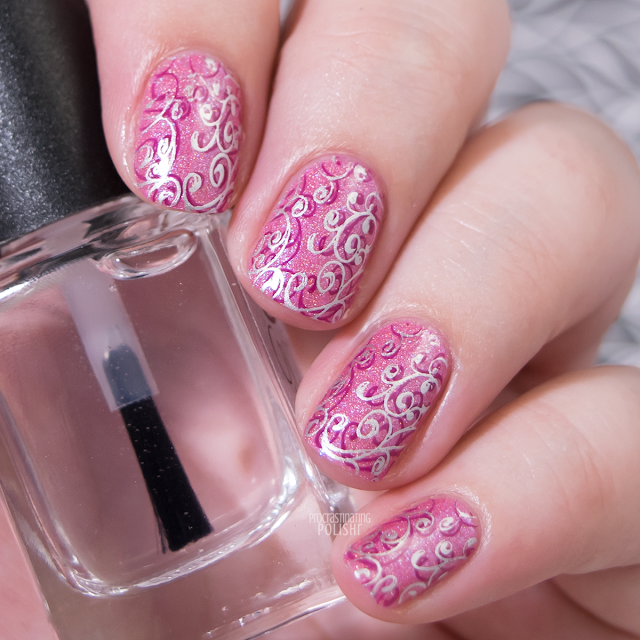 Stamp the image using the pink stamping polish, then repeat with silver, using the clear stamper to position the second layer of stamping slightly to the left of (or right, or above/below) the first layer. Finish with quick dry top coat. This is a cute way to be a little more overtly Valentine's inspired without going for the obvious heart motif. 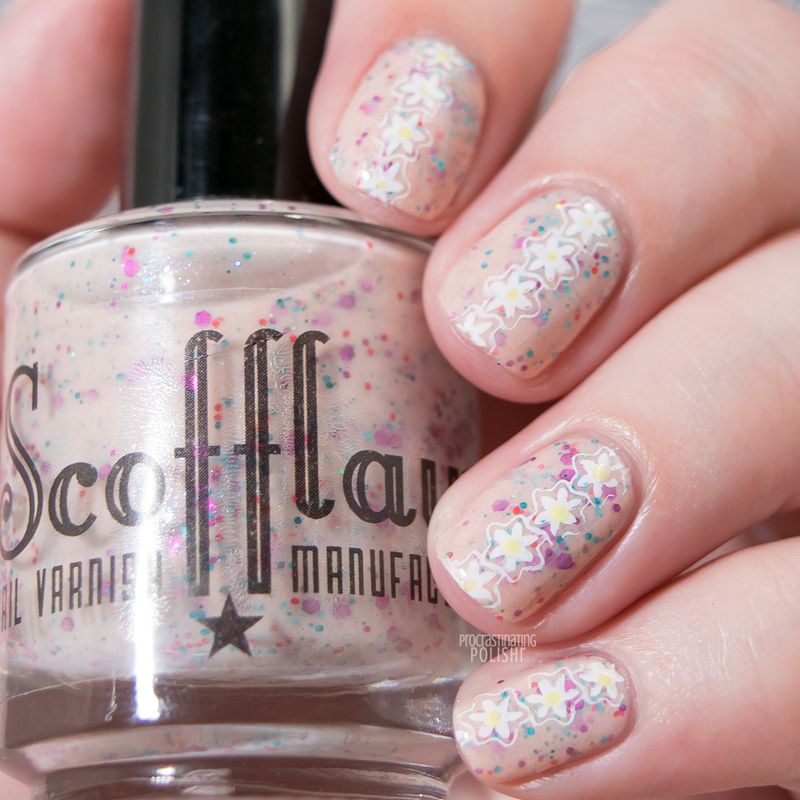 I like a neutral-ish base with this so the colour and sparkle really pops. This barely requires instruction - paint your nails and apply a top coat. Using nail glue or dots of top coat, use a rhinestone picker or tweezers to apply the nail studs. Nail glue will help them stay secure for longer, but top coat will do if it's a one day kinda mani. Grab a small detail brush and paint on your XOX - don't stress about your lines, imperfections give it a cute handwritten look! I top coated this nail again, but didn't do over the studs - while it will make them last longer I really hate the look of top coat over 3D embellishments. Do you have plans for Valentine's Day - or even some Valentine's Day nail art? Let me know in the comments, or tag me on social media if you recreate any of these designs!